CANape displays the measurement results during the recording in various windows as needed. This enables a fast initial online analysis. All data always receive a time stamp and are stored in a time-synchronized manner. This helps you to evaluate the information offline later on. 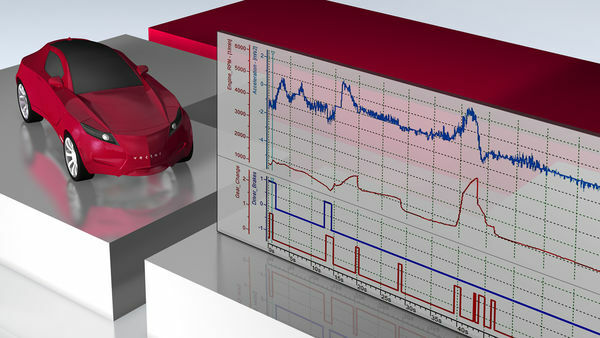 vMeasure exp is a flexible measurement software solution that provides you with efficient support in the laboratory, at the test stand, during test drives and endurance tests. With vMeasure exp, you can conveniently record physical values, internal ECU signals as well as signals sent via the vehicle bus. The vMeasure CSM measurement and analysis software is the ideal supplement to CAN- and EtherCAT-based measurement modules of CSM. With vMeasure CSM you have a convenient tool for configuring your measurement, synchronously acquiring physical values, and storing these values in MDF format. Recording of GPS and video data is also supported. vMDM is the solution for efficient management of large data volumes from development, test bench operation and vehicle tests. With vMDM, you can save your measurement data securely, protect it against unauthorized access and simplify the exchange of measurement data between distributed teams. Large-scale CPU-intensive analyses, classifications and reports are performed centrally on a server without any computational requirements on the engineer’s workstation. The VX1000 system is a scalable solution with maximum performance for your measurement and calibration tasks. It forms the interface between the ECU and a measurement and calibration tool such as CANape. For high data throughput with minimum runtime effects on the ECU, access is by means of microcontroller-specific data trace and debug interfaces. The VX0312 is a compact Ethernet/BroadR-Reach and CAN interface with USB interface to the PC. This interface can be used to connect XCP on Ethernet or BroadR-Reach devices to a PC with measurement and calibration software – quickly and reliably. CANape supports various data acquisition devices of many different manufacturers. “Digital Analog IO” is an open interface for connection of almost any input and output systems. DAIO (Digital/Analog I/O) is an open interface for connection of almost any input and output systems. An open C-interface with development kit and detailed documentation is available to you free of charge for development of your own drivers. Regardless of whether you want to measure voltages, temperatures, or mechanical quantities using strain gauges, or whether you must count events or output signal levels: with the broad range of products, all possibilities are available to you, both in the vehicle and on the test stand. The connection to the PC is by means of CAN interfaces or XCP on Ethernet. Find more information about efficient storage of measurement with MDF format and learn how to implement MDF in your own software.